We ran a report to find the hottest towns in Massachusetts! We compiled data provided by The Warren Group that compares home sales for the second quarter of 2013 to home sales for the same period in 2012. The report shows the largest increases in the number of home sales, a factor which we use to determine whether a town is becoming a sought after location for homeowners. Towns had to have a minimum of 25 home sales for the quarter to be considered for the list. 46 homes sold in Norfolk for Q2 this year, an increase of 100% compared to Q2 2012. Homes in Norfolk sold for $454,500, an 11% increase over Q2 of last year. The Town of Norfolk is a semi-rural suburban community located about 40 minutes outside of Boston. The town is known for having several historic houses, including The Morse House, built in 1693. Norfolk has a stop on the MBTA Franklin Line to Boston, and is close to routes 1, 95, and 495. The population of Norfolk is 11,227, an increase of 7% since 2000. Upton had 40 home sales in Q2, an increase of 100% compared to the second quarter last year. The median price for a home in Upton is $353,000, an increase of almost 7%. Upton has experienced a huge surge in population which is now 7,542, 33% higher than it was in 2000. Located in south central Worcester County, Upton has easy access to both route 495 and the Mass Pike and is just 45 minutes from Boston. Upton residents enjoy the abundant open space available to them, like Whitney Conservation Area, Lake Wildwood Park, and Upton State Forest. The town of Rehoboth comes in third on our list with a 96% increase in the number of home sales for Q2. The median price for a home in Rehoboth is $330,000, a 16% increase over Q2 last year. Established in 1643, Rehoboth is one of the earliest Massachusetts towns to incorporate and as such has several structures listed on the National Registry of Historic Places. Rehoboth is just minutes from Providence, Rhode Island, and is about an hour from Boston. The population of Rehoboth is 11,608, an increase of 14% since 2000. 45 homes sold in Kingston for Q2, an increase of 88% compared to Q2 last year. Homes in Kingston sold for $332,000, an increase of 7% compared to last year. Kingston is a coastal community in Plymouth County located 40 minutes from Boston and 40 minutes from Cape Cod. Kingston is right off of route 3 and has a stop on the MBTA Kingston/Plymouth commuter rail to Boston. The population of Kingston is 12,629, an increase of 7% since 2000. 28 homes sold in Westport for the second quarter this year, an increase of 87% compared to Q2 last year. The median price for a home in Westport is $350,000, an increase of 27% compared to the second quarter in 2012. The population of Westport increased almost 10% since 2000, to 15,532. Westport is located in the westernmost port in Massachusetts, between Fall River and New Bedford. Horseneck Beach State Reservation is located at the western end of Buzzards Bay in Westport. It has 600 acres of barrier beach and salt marsh, and it has a 2-mile long beach, making it a popular destination during the summer. New Bedford is the largest city on our list with 95,072 residents. 146 homes sold in New Bedford for the second quarter this year, an increase of 85% compared to the same period last year. The median price for a home in New Bedford is $165,000, an increase of 27% compared to Q2 2012. New Bedford is a number one fishing port in America and is home to the world’s largest whaling museum. Families enjoy going to the Buttonwood Zoo in New Bedford, which features over 250 animals and 30 exhibits. 44 homes sold in Fairhaven this past quarter, 83% more than Q2 last year. The population of Fairhaven is 15,873. The median price for a home in Fairhaven is $205,000. A seaside community on the shore of Buzzards Bay, Fairhaven is a popular tourist destination where you’ll find West Island Town Beach, several recreational marinas, free walking tours, a number of unique shops and more than fifty restaurants. Fairhaven is also home to Fort Phoenix Beach and Reservation, which offers residents swimming, picnicking, tennis courts, outdoor showers, charcoal grills, and a playground. In Pepperell a total of 42 homes sold for the second quarter this year compared to the same period last year, an increase of 83%. Median home prices in Pepperell have increased 29% compared to the second quarter last year, to $285,000. The population of Pepperell is 11,497 a 3% increase over 2000. Pepperell is 35 miles northwest of Boston adjacent to the New Hampshire border. Pepperell is a quiet community that is dedicated to preserving its history and character. Over the last several years, the town has set aside parcels of land for conservation. A portion of the 11 mile long Nashua River Rail Trail is located in Pepperell. There were 40 home sales for the second quarter in Boxford, an increase of 67% compared to Q2 2012. The median price for a home in Boxford is Boxford is $575,000, an increase of 27% compared to last year and the highest median price for a home on our Top 25 list. Boxford is a rural town with scenic hiking trails, lakes, ponds, streams, and wildlife, yet with easy access to route 95, it’s just a 35 minute drive to Boston. 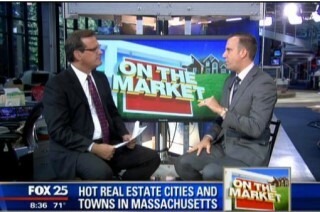 Boxford is one of the towns featured in this summer’s Fox 25 Morning News Zip Trips, where we will broadcast live on August 23rd to show select homes on the market in the town. The population of Boxford is 7,965. Home sales in West Newbury rose 67%, to 25 sales in the second quarter of 2013. West Newbury is our smallest town in the Top 10, with a population of 4,235, a 2% increase since 2000. The median price for a home in West Newbury is $500,000, an increase of 16% compared to Q2 2012. West Newbury is located in Essex County, close to route 95. The town is about a 45 minute drive to Boston. West Newbury is bordered on the north by the Merrimack River. It has several areas for outdoor recreation including the Crane Pond Wildlife Management Area with over 2,000 acres for hiking, horseback riding, and cross-country skiing.